RTÉ JOURNALIST PAUL Reynolds has told the Disclosures Tribunal that he was never negatively briefed about Sergeant Maurice McCabe by anyone in the gardaí. Reynolds also said that the assertion from former garda press officer Superintendent Dave Taylor that he received such a negative briefing from Taylor “just didn’t happen” and “doesn’t make sense”. His account was mirrored by that of earlier evidence from journalist Paul Williams, who told the Tribunal this afternoon that he was never told such negative about Maurice McCabe from any senior garda. Williams also said that he has been “eviscerated” because a “whole narrative” has developed that he was involved in a smear campaign against garda whistleblower Maurice McCabe. The Tribunal is continuing to look into claims that there was an orchestrated smear campaign run against McCabe by Taylor on the orders of former commissioner Martin Callinan. However, many of the journalists Taylor claimed he smeared McCabe to have said that this never happened. Reynolds told the Tribunal today that he had heard the rumours about Sergeant McCabe but that it was always to the effect that there had been an allegation of sexual abuse against the whistleblower, that he was exonerated, and that there was “nothing in it”. It’s Taylor’s assertion that he would “opportunistically” drop in the allegation against McCabe and say that he was motivated to draw attention to deficiencies in the gardaí because he was motivated by revenge. The superintendent said he would often do this at crime scenes. Speaking today, Reynolds said this “just didn’t make sense”. He said that crime scenes would be chaotic places, where journalists grouped together and would focus in on the topic at hand of getting the story about that particular event. Paul Williams was first asked about being named in the Dáil as being one of those who’d had penalty points wiped. He said that he was “surprised” and “didn’t see it coming”. Williams also said that he “had nothing to hide”. He said that it was in relation to a fixed charge penalty notice that had been done by the book, and he had appealed it successfully. He was also asked if he was aware that Maurice McCabe may have been behind these details getting into the public domain. Williams said: “I didn’t know who was responsible… but I knew I didn’t do anything wrong”. The journalist rejected the assertion of Superintendent Taylor that he received a negative briefing from the press officer prior to visiting Ms D to interview her. Ms D made an allegation of sexual abuse against McCabe in 2006 that he was exonerated of. However, she was unhappy with the investigation and spoke to Williams about her concerns in March 2014, and the journalist subsequently wrote a number of stories with names anonymised. Williams denied ever getting such a briefing from Taylor and said he asked a number of questions of Taylor after interviewing Ms D to double-check details she had given him. Furthermore, he said he’d made the decision to disclose his telephone records to the Tribunal to support his account of conversations with Taylor. Taylor has claimed that he spoke to Williams on the day that the journalist interviewed Ms D, while he was still at the house. The phone records, however, do not bear that out. He said – given Taylor, O’Sullivan and Callinan had all signed waivers on their privilege – that he’d have no problem disclosing if they had told him anything negative about McCabe. Williams reiterated that he had “nothing to hide” and had no involvement in a smear campaign. Furthermore, he said that he had been “eviscerated” on social media and by colleagues over his supposed role in the smear campaign. 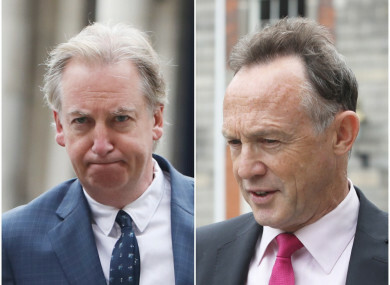 Williams also told the Tribunal that he hadn’t heard any specific rumours going around about Maurice McCabe and this allegation of sexual abuse. The Tribunal has already heard from journalists that rumours were going around about McCabe and this allegation from 2012 onwards. He said he was aware of a “rumour out there that McCabe had a grievance with his authorities and he’d fallen out with them”. It was put to him that as such a senior journalist he’d have heard this specific rumour that was going around. Williams said he doesn’t regularly go into the office, he didn’t mix in political circles and wasn’t mixing in the general milieu. Ian Mallon, the former group news editor at INM, also continued evidence today. He was cross-examined by counsel for former Irish Independent journalist Gemma O’Doherty over her visit to the home of Martin Callinan while pursuing the story that the commissioner had penalty points wiped. Mallon said that he received a call to say that Callinan’s wife – who answered the door – was distressed by O’Doherty’s visit. Mallon said that O’Doherty should have got approval from her superiors before she went to do that. He denied being extremely angry with O’Doherty over it. Mallon was also asked about the decision to publish the Paul Williams stories about Ms D. Williams went to interview her in March 2014 and then wrote a number of articles about it without mentioning McCabe. It was put to Mallon that the sequence of articles had the effect of “propagating unwarranted speculation” about McCabe and that “anyone in the know” would have known it referred to McCabe. Mallon, however, rejected that. The Tribunal will continue with further evidence from Paul Reynolds tomorrow. Email “Paul Reynolds says that Taylor's claims of smear campaign 'just doesn't make sense'”. Feedback on “Paul Reynolds says that Taylor's claims of smear campaign 'just doesn't make sense'”.